A tragedy has occurred, one which we, as car enthusiasts, have a moral imperative to right. This goes far beyond someone simply buying an FR-S with an automatic transmission, far beyond someone daily driving an Aztek, and even farther than someone willingly purchasing a PT Cruiser. “What could possibly be worse than buying an Aztek or a PT Cruiser?” You’re probably saying to yourself right now. 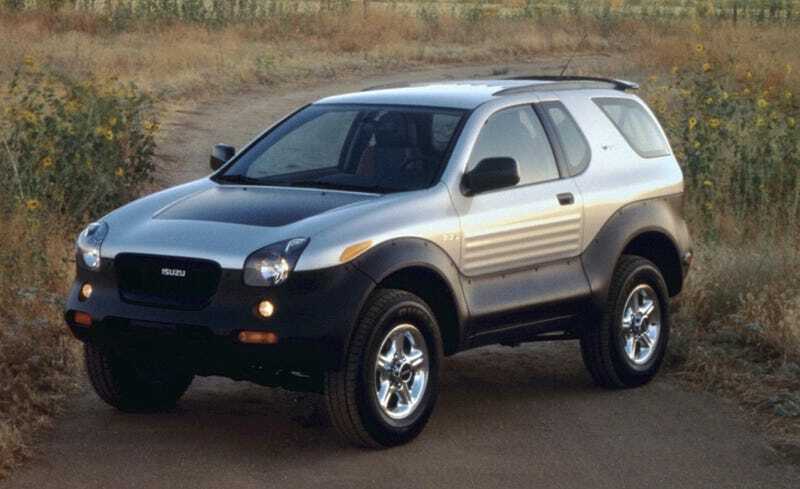 “I thought those cars were purpose made to torture unsuspecting car buyers.” Well, I’ll tell you: Road and Track insulted the Isuzu Vehicross. I’ll take a moment to let the uncontrollable rage that’s filling your chest right now subside enough for you to wipe that foaming spittle away from your mouth. Gross. Get a hold of yourself. Ok, it looks like you need another moment. Please try not to throw up in here. I just cleaned. Better again? Now that you see my point, I’m sure you are all in the process of angrily writing letters to Larry Webster, the editor of Road and Track, so let me give you a little background for that letter. The Vehicross is one of the best examples of a concept making it to production untouched despite obvious quirks. It was a three-door SUV that combined all of the off-roading capability that Isuzu could muster with all of the dimensions of a Samurai that no one wanted or asked for. The results were divine. The Vehicross was the first car to use a 3D modeling system that measured changes in the road surface and adjusted the suspension and power delivery based on these measurements. Coupled with the low overhangs at the front and back and generous ground clearance, the computer system made the Vehicross the most capable off-roader that Isuzu ever made. It also had stunning looks lifted straight from the concept and an innovative interior that was both luxurious and starkly practical. The seats also used red and black leather stitched together, which is by far one of the coolest combinations for an interior. The Chevy Nomad on the other hand was a concept built on GM’s Kappa platform in such a manner that the platform was no longer “sporty” or “attractive” as it was originally billed by The General. Pinafarina provided the coachwork, but even they were unable to bring any fire to the design. It truly was the height of the retro styling craze that made everyone question whether the U.S. auto industry had any ideas left. GM may not have had any good ideas left but they at least had enough sense to scrap the Nomad and make something more sensible instead. So Road and Track basically stated that they would rather have a terrible retro re-hash rather than a super capable and uniquely styled off-roader. This is more than enough cause to ask Road and Track for their gearhead membership card back. We expect an apology, not just for the people who trust your magazine, but also for the Isuzu Vehicross, a severely under appreciated vehicle.